It appears that when Kaden had his June school holidays, I was on a holiday mood and hardly wrote on this blog too! Now that he’s back at school, time for a fresh post! Anyway, since last week I’ve been coming across several online news articles that focus on the importance of reading to your baby from Day One. The American Academy of Pediatrics has issued what local experts are calling an important policy statement on childhood literacy and reading to kids beginning Day One. The policy is the first of its kind for the academy. 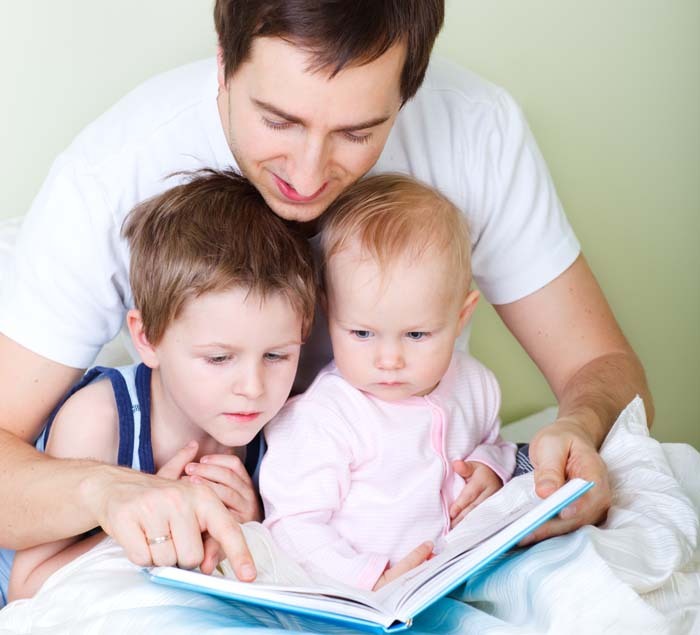 It recommends that pediatricians encourage parents to read aloud to their children every day and that policymakers make books accessible to families. It also will partner with other organizations, including Scholastic, to distribute informational toolkits to families as part of the effort. While your little one might not be expressing any interest or might even be roaming around the room while you read, continue reading to your baby! Some weeks or months further down, he or she might grow an interest in books. That’s what happened to Kaden. I didn’t read to him from Day One. No, I was too busy trying to cope with being a new mother and reading wasn’t on my list for more than 6 months. I started probably when he was around 7 months old. He wasn’t interested in me reading to him though, he was more keen in chewing the board books back then. But many months later, when he’s about 2 years old, I began to see him picking out books and browse through them on his own. Very recently, over his June school holidays, on a few occasions, I saw Kaden taking out books, sitting or lying somewhere around the house, and reading aloud. Wow. But I didn’t interrupt him to praise him on his new found independence on reading, I just let him carry on and make no mention of it. He’s 3 years and 4 months old. In the same article by Timesonline.com, a pediatrician with Heritage Valley Pediatrics, Dr. James Scibilia, points out that numerous studies have shown the importance of reading aloud to young children and exposing them to bigger mix of words right from the beginning. Dr Scibilia also highlights that when parents read a lot to their children and used a lot of language with their children from young, like under age 3, dramatic differences could be spotted in the kids’ ability to use language when they turn 7, 8 or 9 years old. These kids also develop higher reading and academic skills. Ninety-six percent of children under five years old see their doctor at least once a year, and the opinion of a physician often carries more weight with parents than that of a teacher or counselor. Taking advantage of this privileged position, a growing number of pediatricians are “prescribing” books to their young patients at each visit (some of them even write out the directive to read on a prescribing pad). If you have a baby at home, and you haven’t started reading to her, it’s a great time to start now. Don’t wait for your kid’s pediatrician to urge you, it might not be happening, as it’s not happening in my country as we don’t have such a reading movement by our local pediatricians, yet. I also find that reading to Kaden when he was still a baby, helped to create precious bonding time. The snuggling, turning of pages, highlighting new words, ideas, pictures, textures to him, all these formed warm memories of our spending time together. It didn’t take long to read a picture book or board book, in fact, it’s only a few short minutes. These minutes will accumulate into many hours over the days, months and years. And the effects could be long term, as there have been studies to show that developing strong literacy skills from young could affect how well a child do in school and academically. And this in turn would affect the kind of job opportunities open to him or her later on in life. So let’s keep on reading aloud to our little ones! When did you start reading aloud to your kid? What kind of impact do you think reading aloud since the first days of a child’s life could have on his or her life later on? I’d love to hear what you have to say!